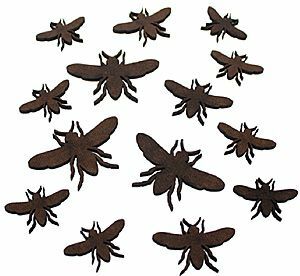 Let’s hear it for the fuzzy buzzing bees that make our lives so sweet! 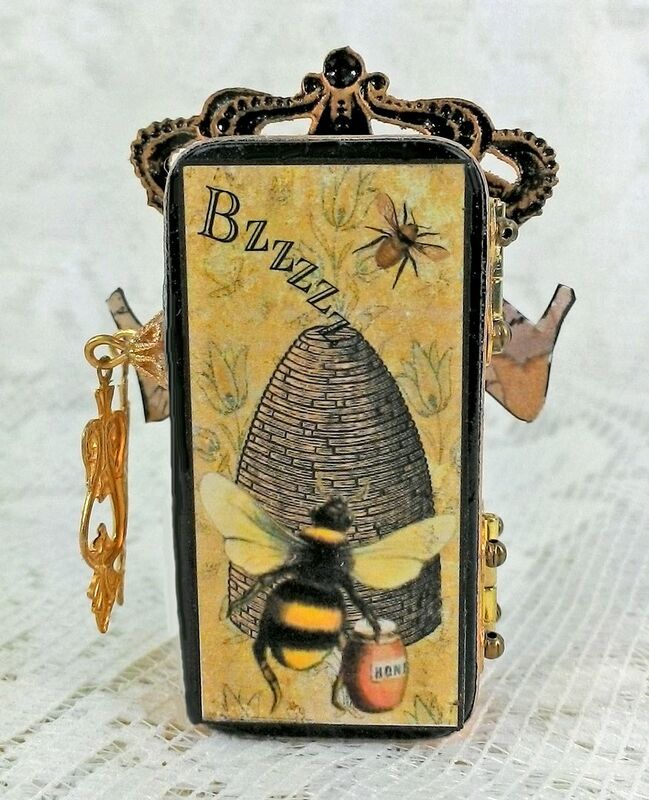 I love everything about bees. 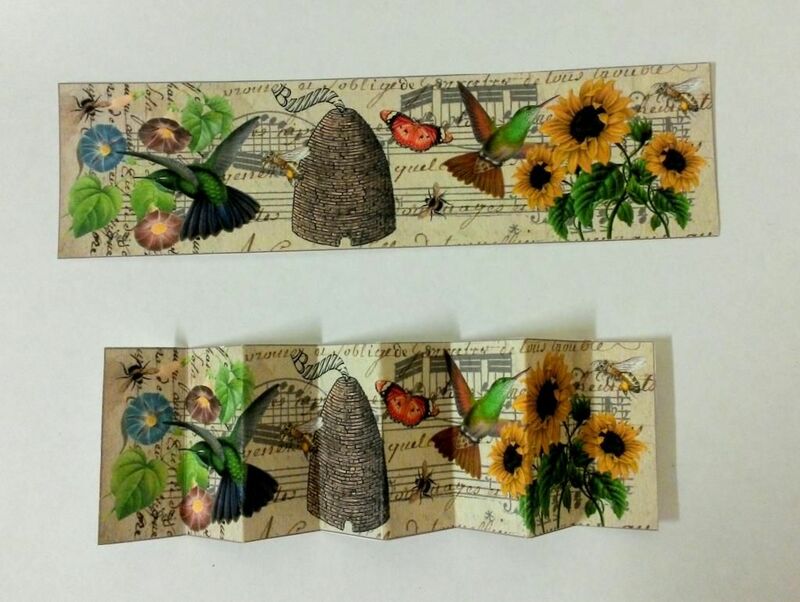 I’ve used the tiny busy creatures as inspiration for four projects and two new collage sheets. The projects include two different domino books; which I’m giving away (details below), an accordion folded book in a box and a set of coasters. I’m thinking any of these projects would make great gifts. 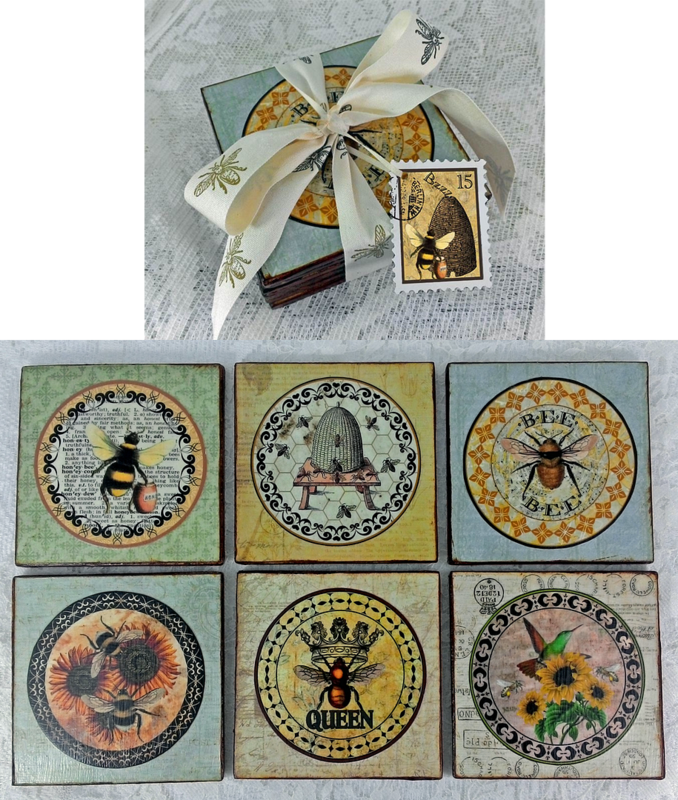 Colorful bee themed medallions and faux postage fill this sheet. 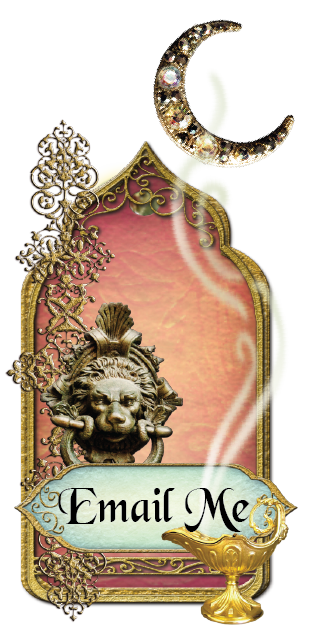 The medallions make great labels for bottles, jar lids and on coasters. 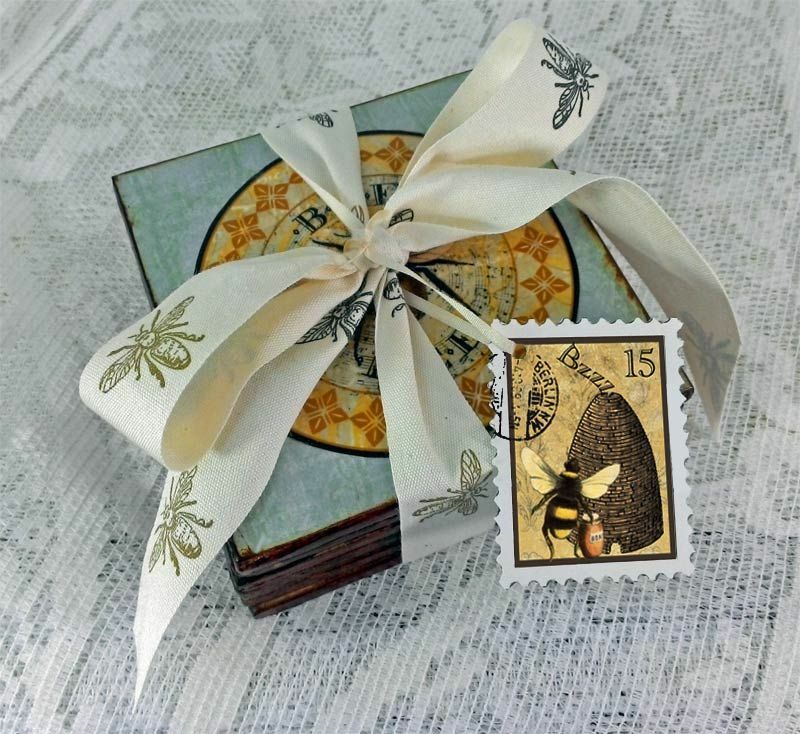 The faux postage can be used as ephemera on your artwork or to jazz up envelopes. 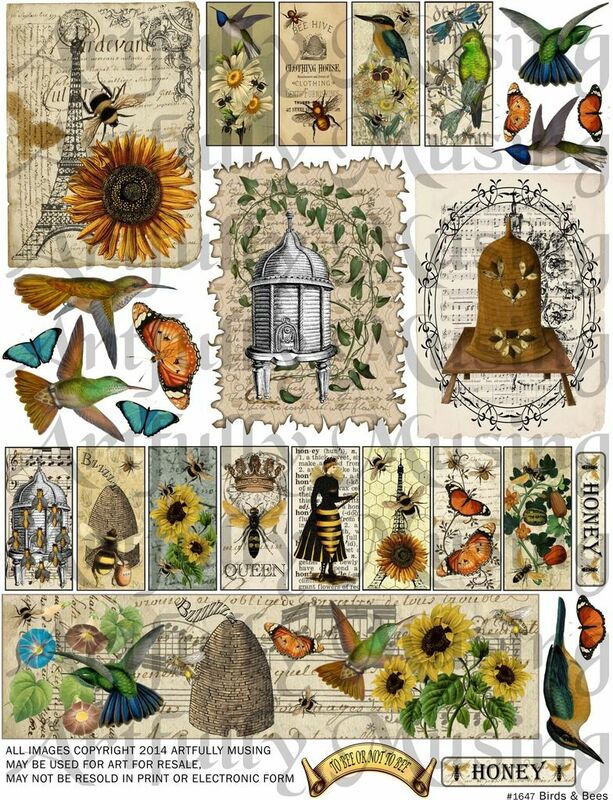 This sheet is loaded with bird and bee themed art. 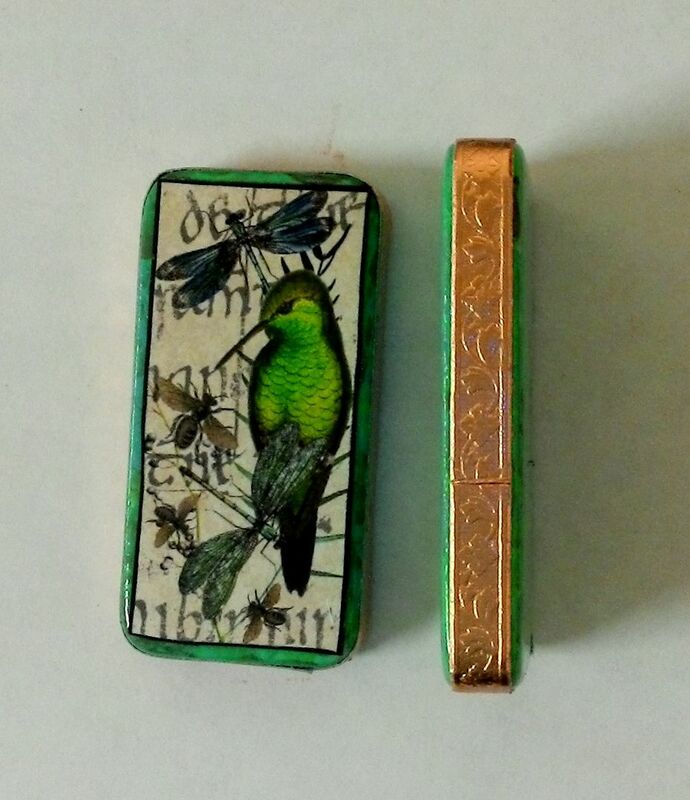 Included are 12 small panels are sized to fit on a 1” x 2” domino and a long panel that can be accordion folded to fit inside two 1” x 2” dominoes like a book. 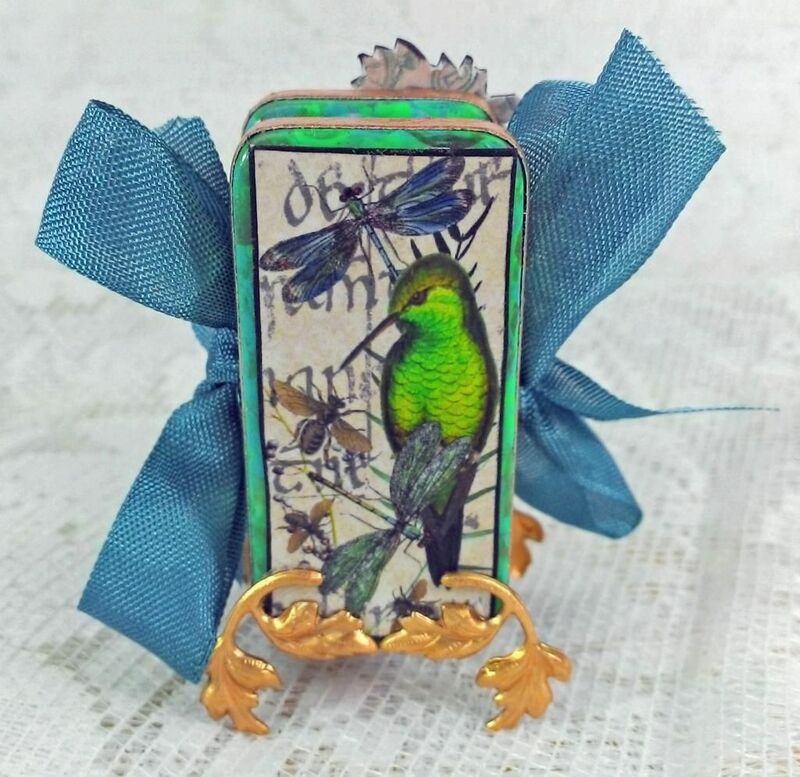 There are also ATC sized collaged images and extra birds and flowers. I started by painting the domino's front, sides and edges of the backs with a combination of Patina Paints. Next, I glued a panel from the collage sheet onto what will become the back of the book and glued a strip of Dresden around the edges of each domino. Using E6000, I attached the brass leaves to the bottoms of the dominoes to serve as feet. To the backsides of each domino, I attached ribbon which is used to tie the book closed. Don’t worry if you see the glue seeping through the ribbon as it will be covered with the accordion folded pages. 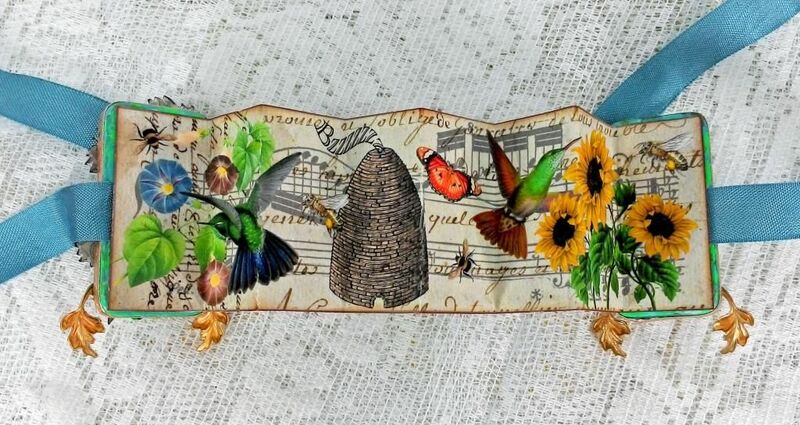 On the front domino I collaged images from the collage sheet (flowers & bird), various brass leaves, paper roses and a bee. 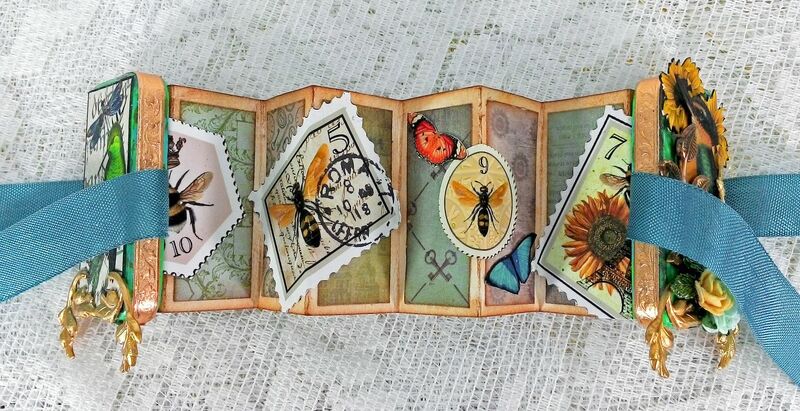 The long panel on the collage sheet measures 1 7/8” x 7” which is slightly shorter than a standard 2” tall domino and long enough to create an accordion folded strip with 8 panels. If you are not using the image from the collage sheet for your book just be sure that when you fold your strip you end up with an even number of panels (to facilitate attaching it to the domino covers). Mark and score along the panel every 7/8” and accordion fold the panel. Ink the edges and the back of the panel. 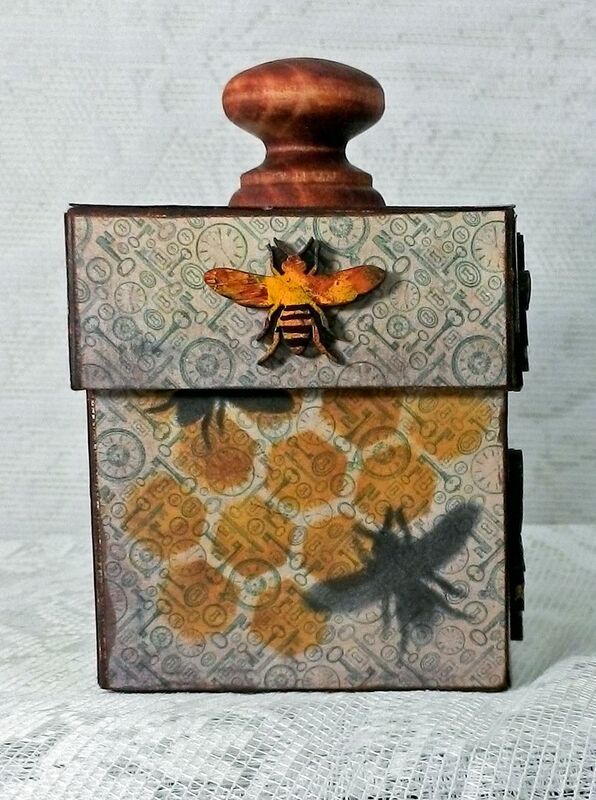 I used Vintage Photo Distress Stain. Cut 8 panels from decorative paper and glue to the back. I cut my panels 1 5/8” x 6/8”. You could also use the small panels on the collage sheet but you would need to reduce them first. 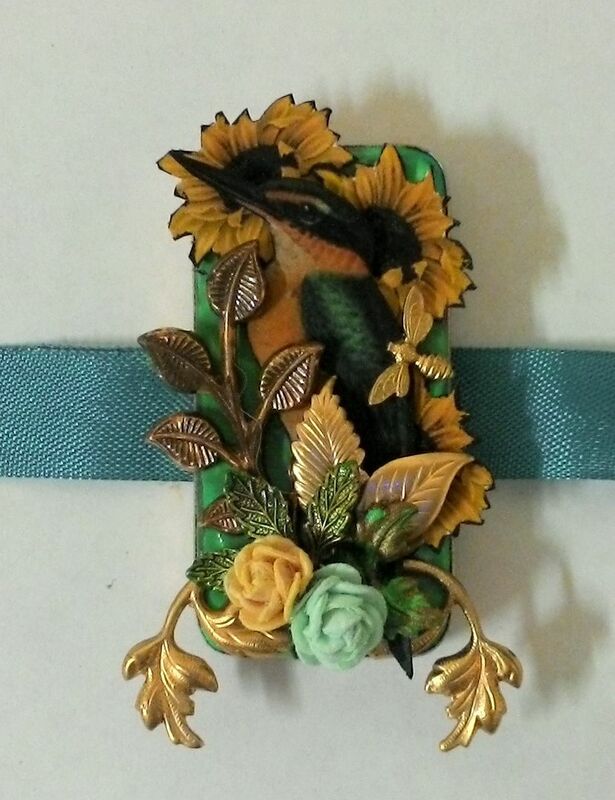 The final touch to decorate the back is the addition of some of the faux postage from the collage sheet. The last step is to glue the end panels to the inside of the dominoes and you are finished! 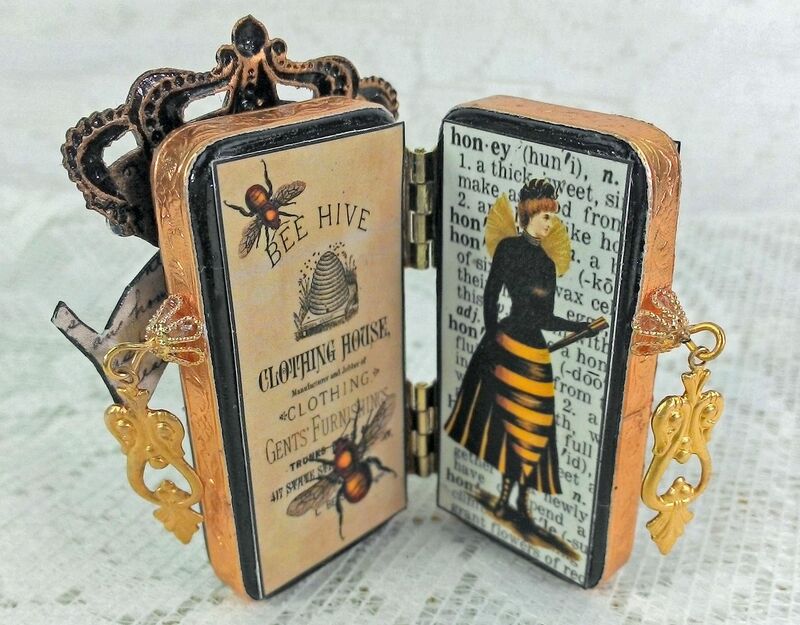 This type of domino book is much simpler to put together as it consists of simply hinging two decorated dominoes. Start by coloring your dominoes on all of the surfaces that will remain exposed after embellishing. I used Onyx Patina to paint mine. I used panels from the collage sheet to cover the backs and fronts of both dominoes and glued Dresden around the edges. Dresden Note: In the case of a hinged domino book use sturdy glue like E6000 to attach the Dresden so that when you attach the hinges to the sides (onto the Dresden) the Dresden won’t pull away from the dominoes when you open the book. 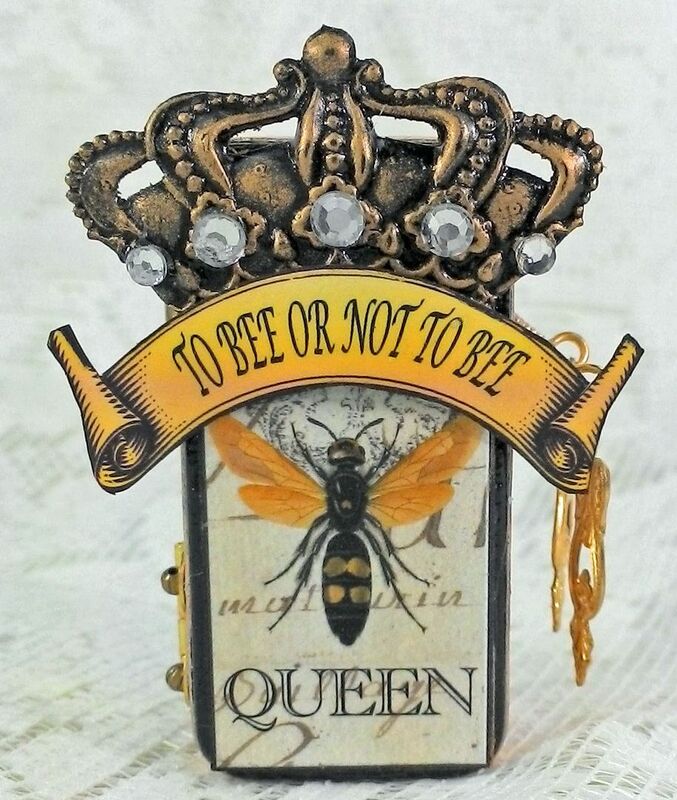 I also added the crown (with jewels) and the bee banner from the collage sheet. Once I had finished decorating each of the dominoes, I glued two small hinges to the sides of the dominoes (using E6000). 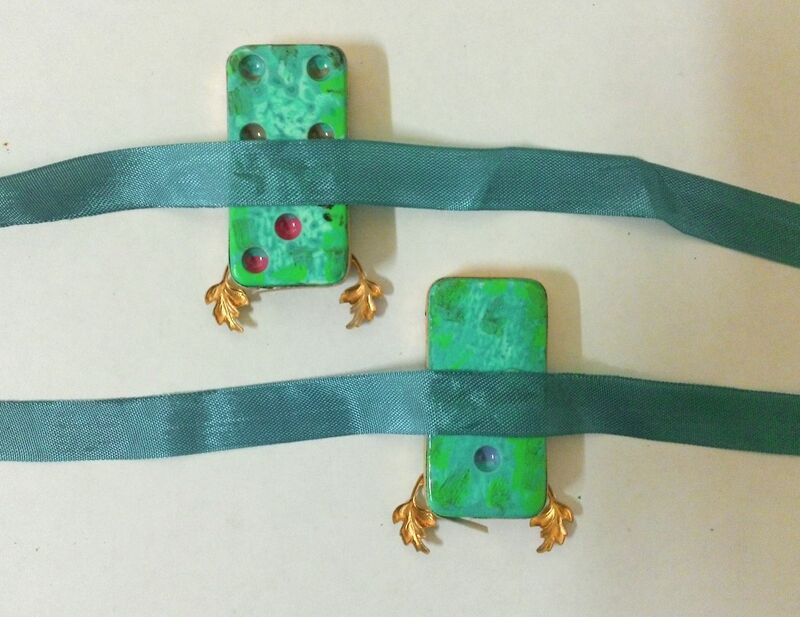 In the hinge holes I glued small brass beads. Make sure you let the glue dry completely before trying to open the book. The final touch are handles (glued in place with E6000), which are made from bead caps, eye pins and Victorian drops. 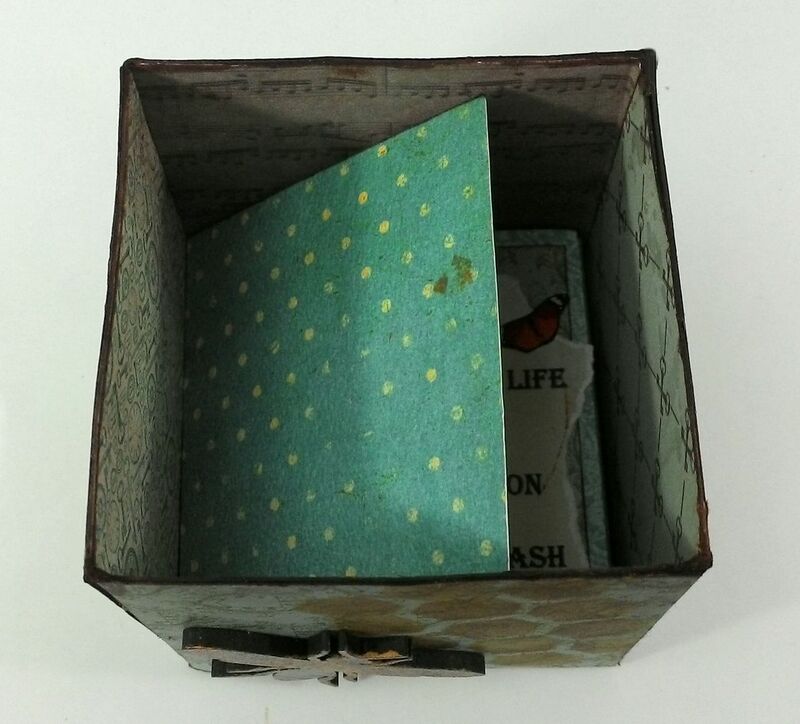 The idea with this project is to use the box as the covers for an accordion folded book. When you lift the cover off of the box it opens the book. 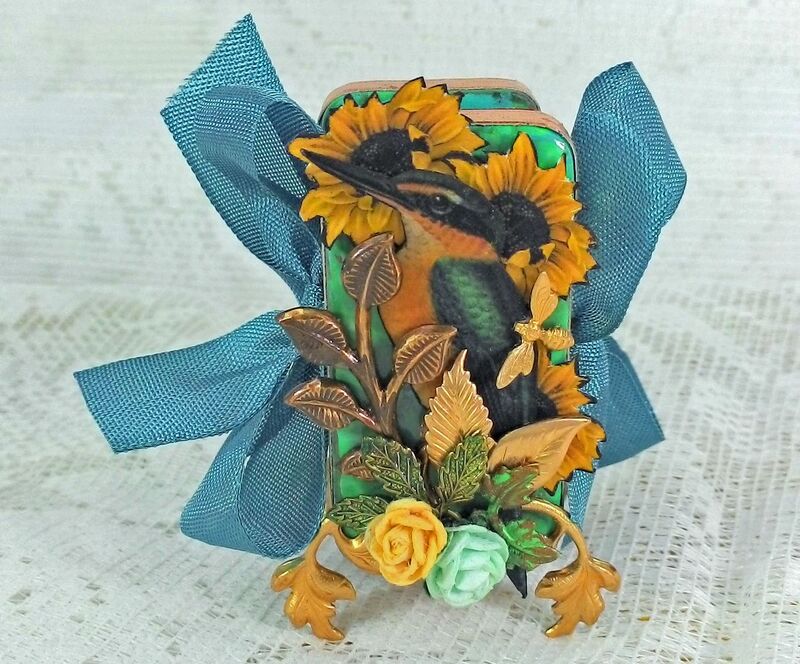 The book is attached at one end to the inside lid of the box and at the other end to the inside bottom of the box. The box I used measures 3" square. Start by assembling the box. Next, I inked all of the edges inside and out. 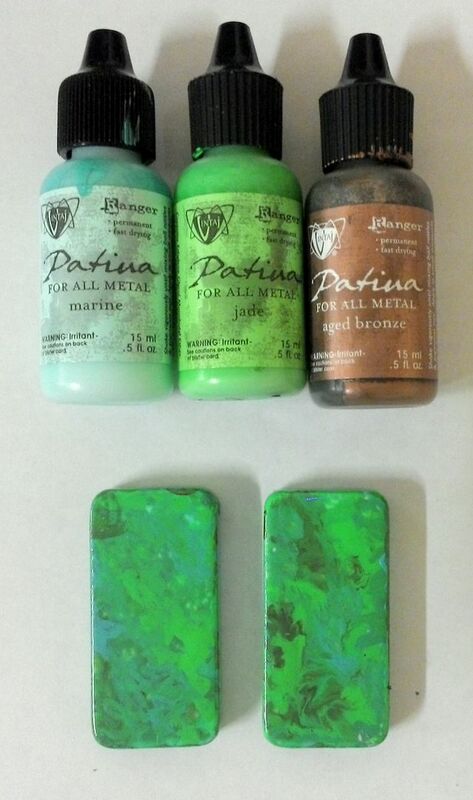 Tip: to get in the box crevices use alcohol ink and a brush. I have brushes dedicated to using the ink as once they are use with ink you can’t use them with other products. 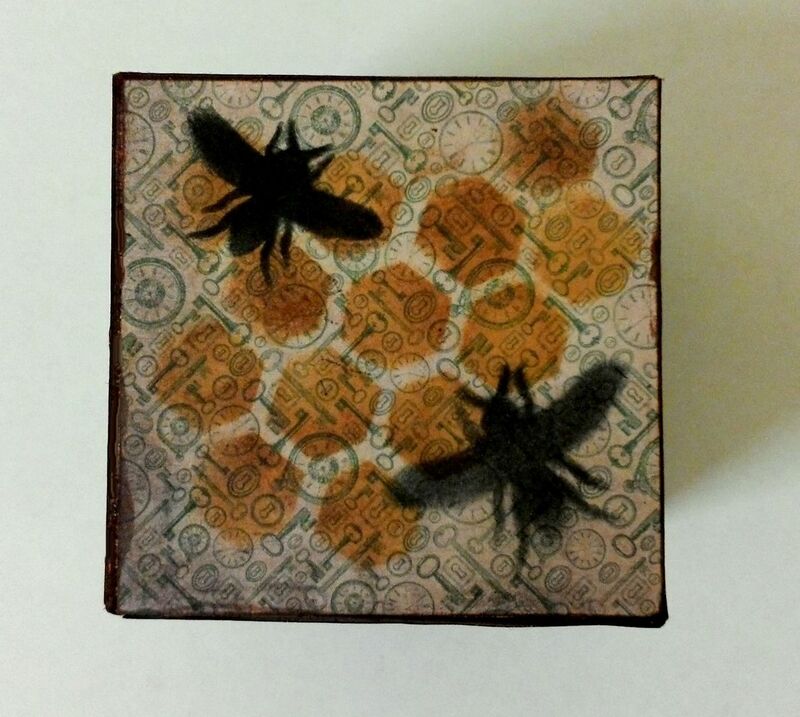 I used a combination of Vintage Photo Distress ink and Caramel alcohol ink. I applied decorative paper to all of the surfaces, inside and out. 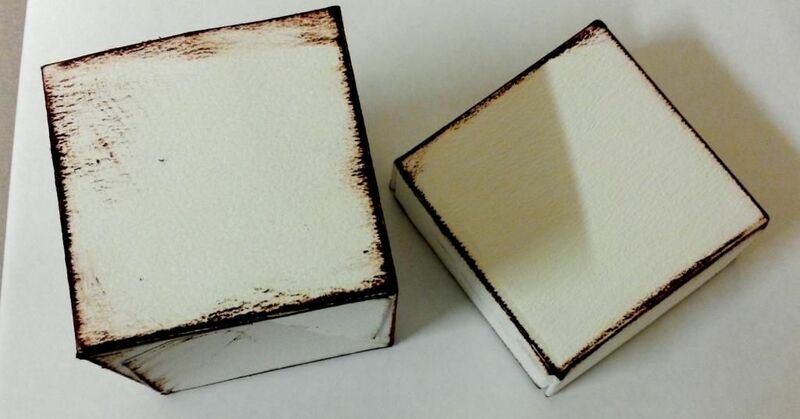 Be sure to glue the paper down securely so that when you open and close the box it does damage or lift the paper. Don’t use thick paper or card stock as the lid won’t fit back on the box. 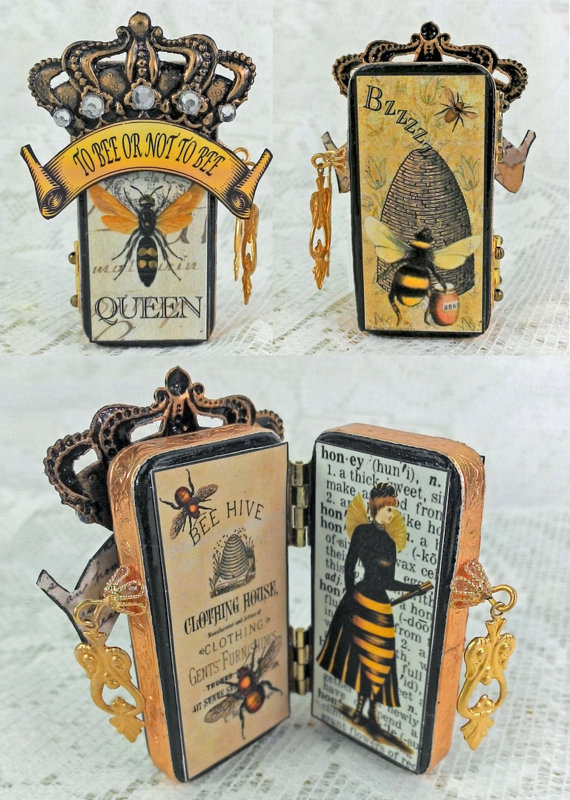 I used Distress Ink and a honeycomb and bee stencil to decorate the sides. 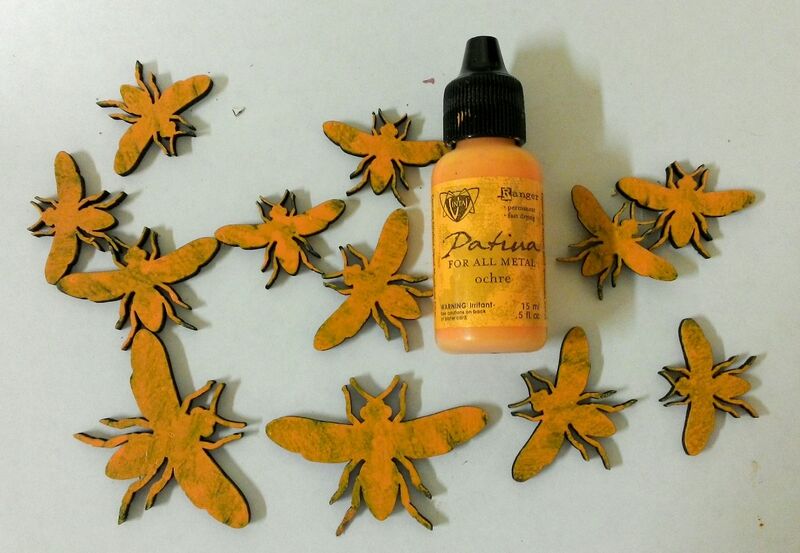 For an additional decorative touch I used Masonite bees. 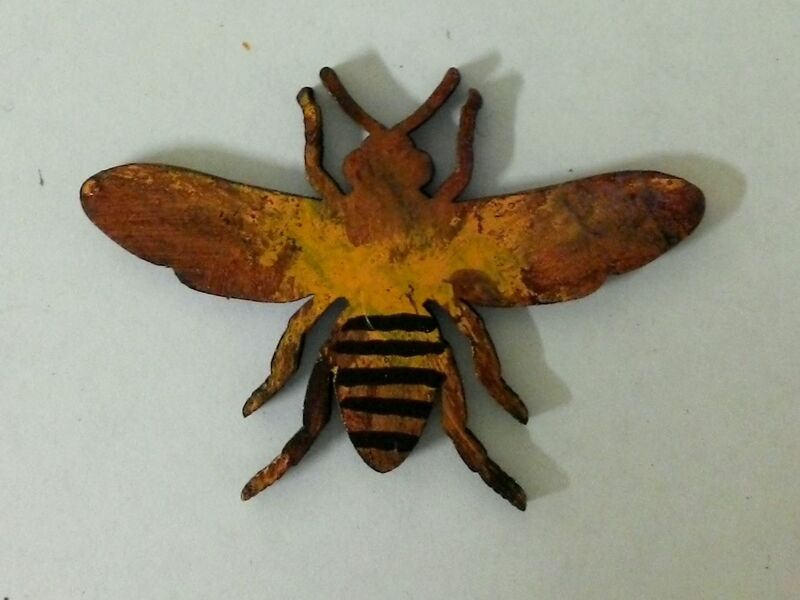 I started by painting the bees with Ocher Patina paint. I didn't completely cover up the brown of the Masonite but tapped the paint on with a brush. 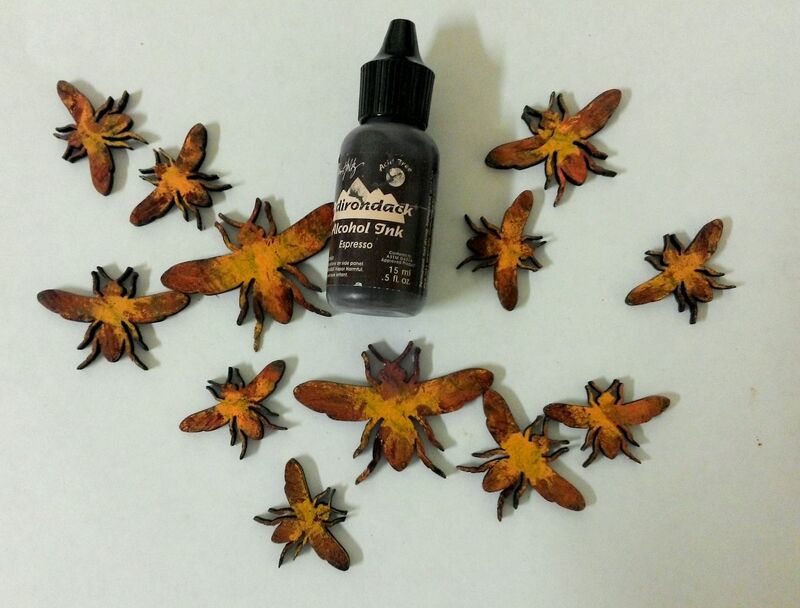 Next, while wearing a rubber glove, I used my finger to lightly brush on Espresso Alcohol Ink. For a final touch I used Onyx Patina paint to paint black stripes. 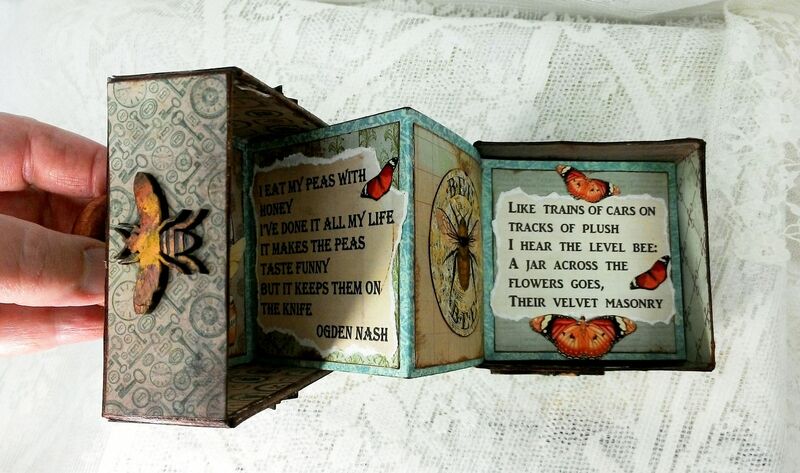 To make the book, cut strips of decorative paper 2 7/8” tall and as wide as the paper. Cut as many strips as you like based on how many panels you want in the book. 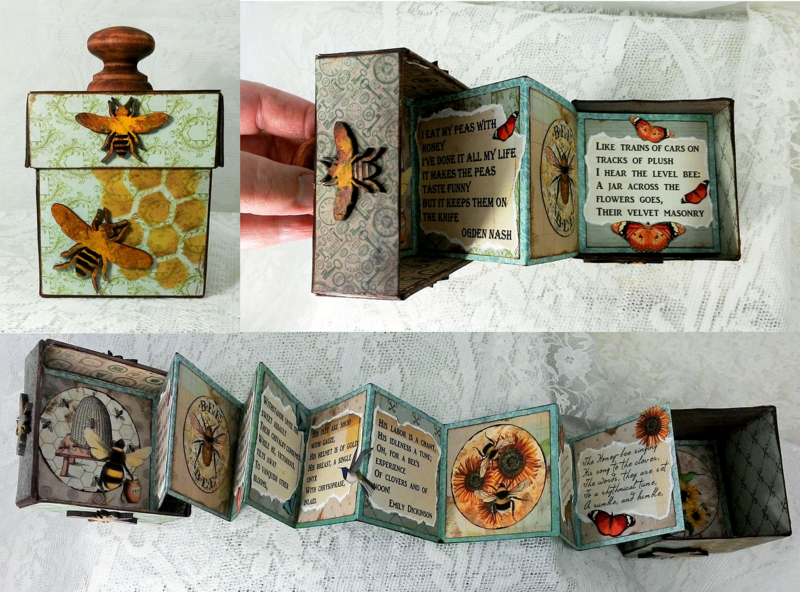 The only restriction to the number of strips is the size of the box and you must have an even number of panels to facilitate gluing the book to the box. 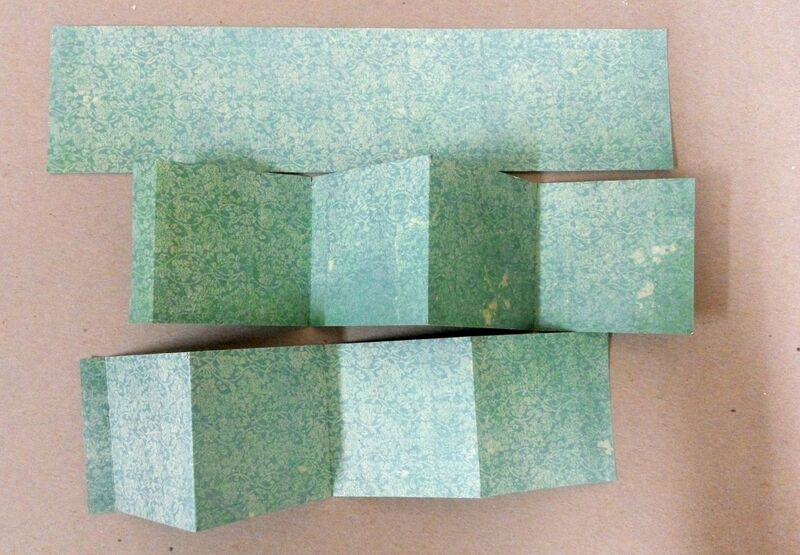 I suggest using 12x12 paper as the strips will be longer and you will have to cut and glue fewer together. 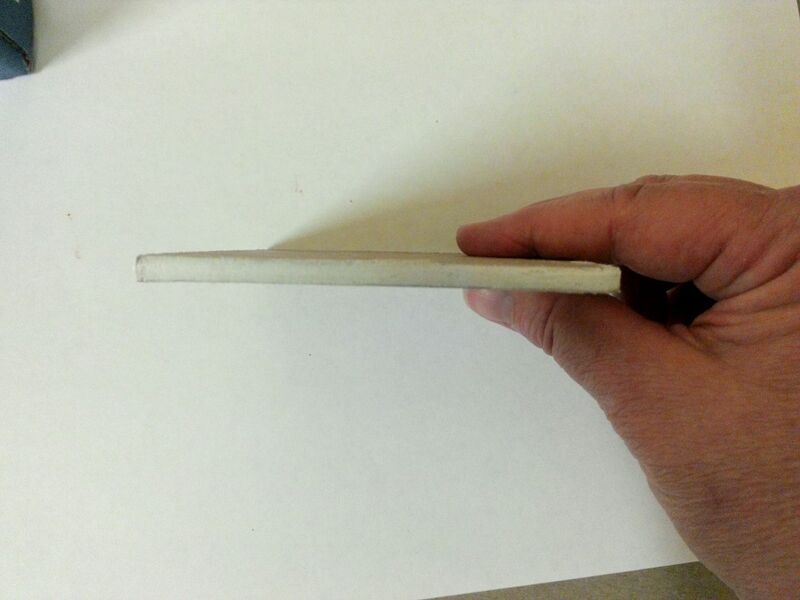 Score and fold the paper strips every 2 7/8". You should end up with a short piece at the end of each strip which will be used to connect the strips together. For the sample piece, I cut 4 strips. Connect the strips together. Cut away any short sections that you didn’t use to connect the strips. I decided to go with 14 panels. Notice the direction of the folds and how the end pieces lay flat on the surface (this means the book is folded in the right direction. Decorate the pages. Be mindful of the bulk of the book to make sure it will fit in the box. 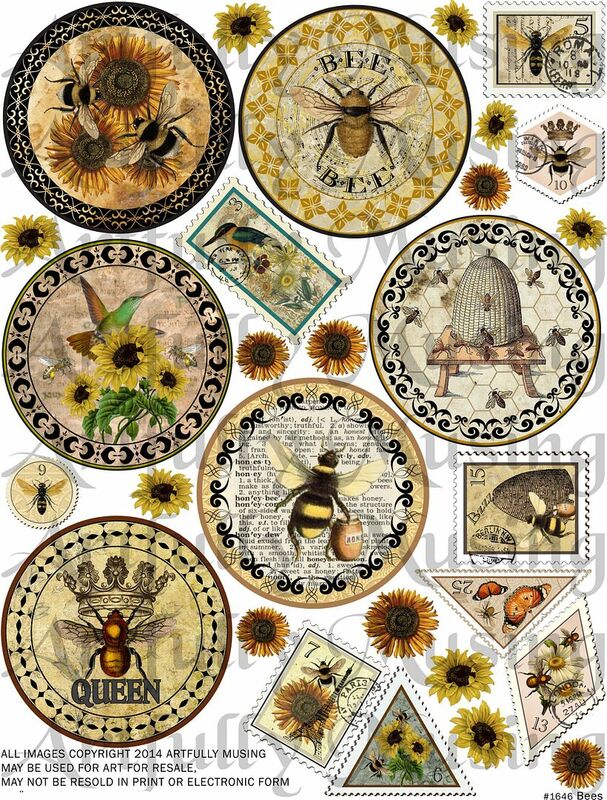 In addition to using images from the collage sheets I also used bee poems. 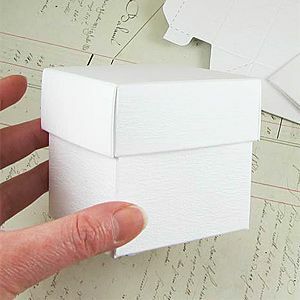 Glue one end of the book to the inside bottom of the box and the other end to the inside lid of the box. 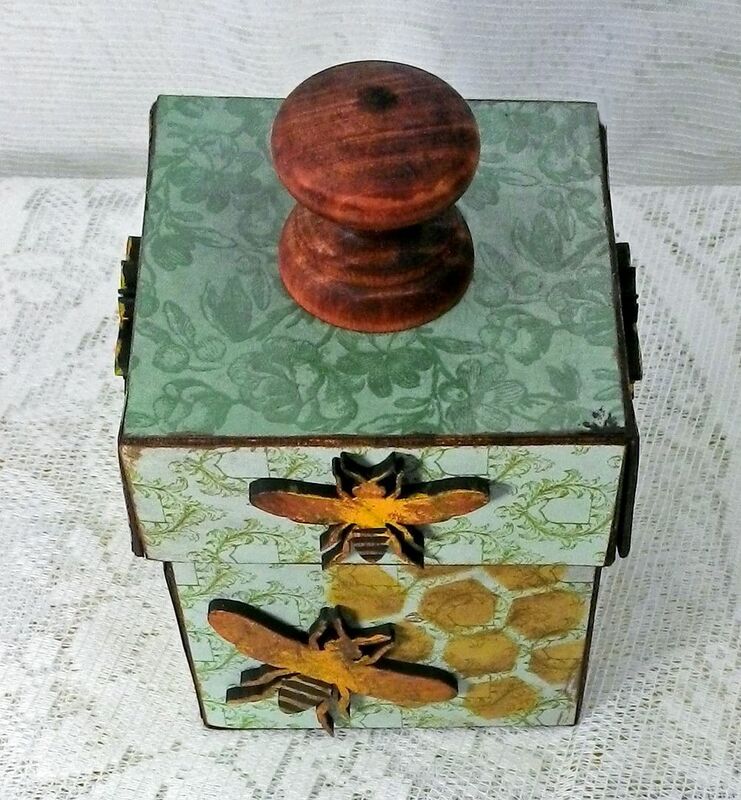 Lastly, I added a stained wooden knob to the top of the box. 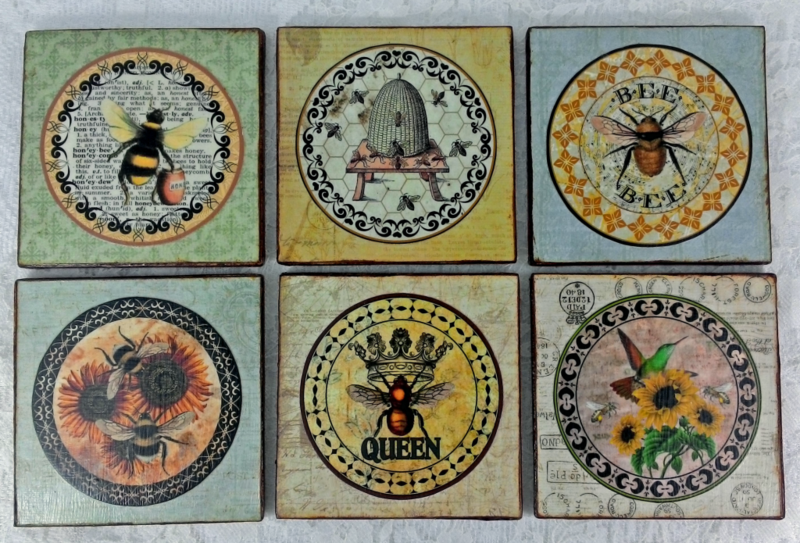 After creating the Bee collage sheets with the round medallions, I was thinking that they would be perfect for coasters (I need a new set of coasters). I think they would also make a great gift. 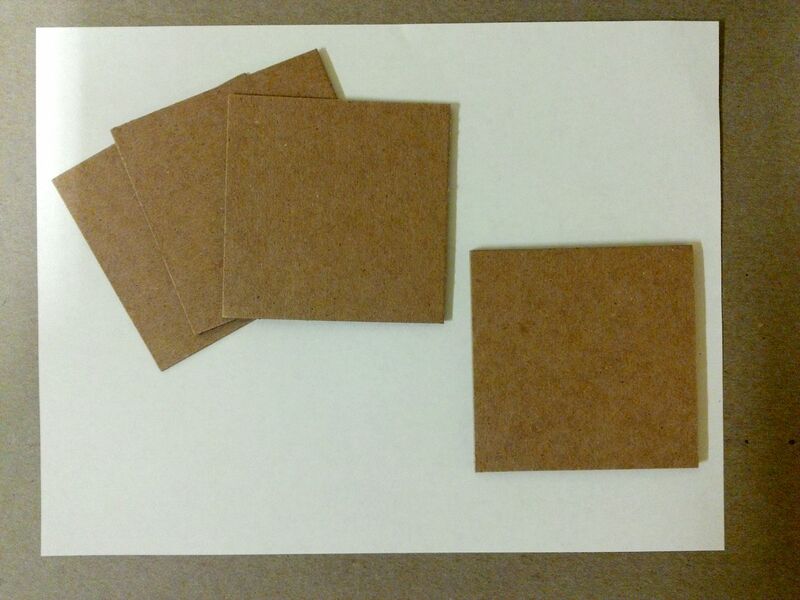 To make each coaster I cut 3 pieces of heavy chipboard 3 ½” square. I glued the 3 pieces of chipboard together to form one coaster. I sanded the edges to make sure they were even and that there were no loose bits. Next, I applied a product called Texture Magic to the edges so that you could not tell that there were 3 pieces layered together. I used this product because it was handy but you could use anything that you might have like Gesso, wood filler, embossing paste etc. ; anything that hides the layers. I lightly sanded the edges one more time to make sure they were smooth. 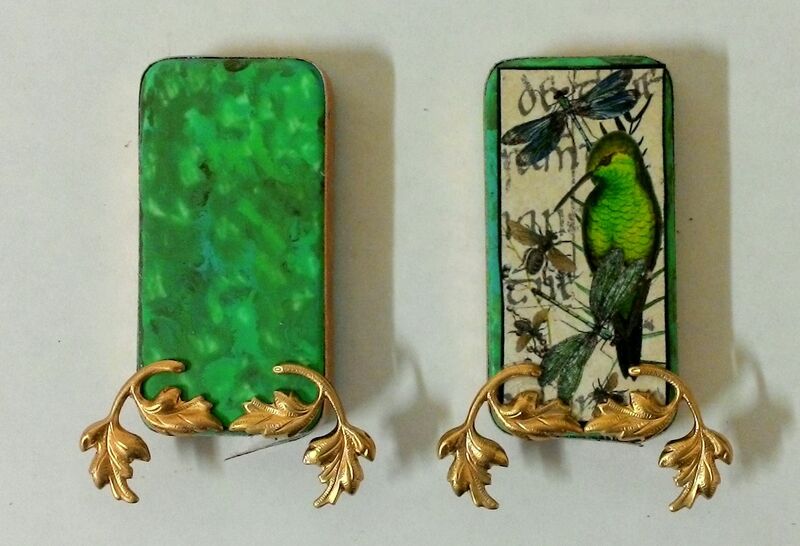 Next, I used Vintage Photo Stain to color the edges (you could also paint them). Depending on the product you used to cover the edges, you may or may not be able to stain them. 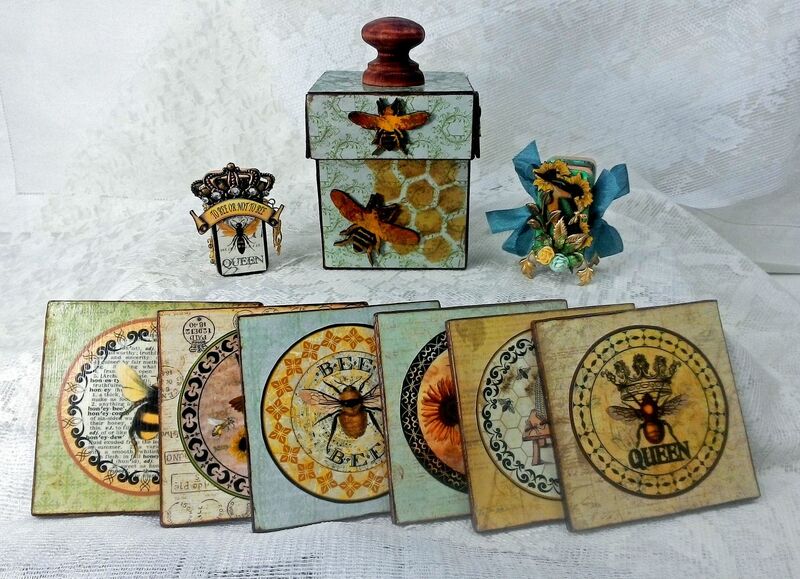 I glued decorative paper to each side and then the medallions from my Bees collage sheet. 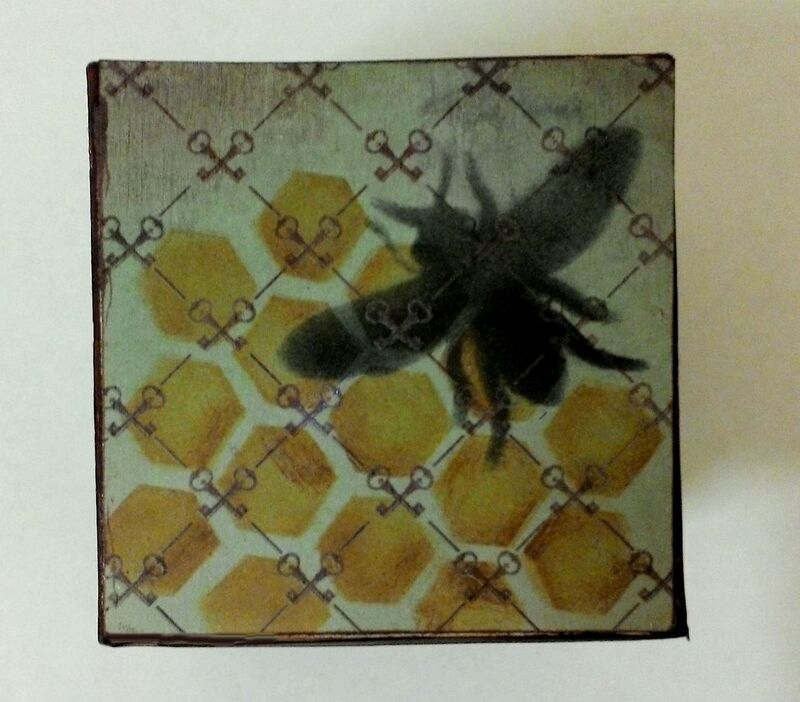 I sealed the coaster by painting it with multiple layers of Mod Podge.